Joe Baum first saw the Rainbow Room in 1940, on a field trip with his freshman class at Cornell School of Hotel Administration, the upstate incubator for pro hosts. High atop 30 Rockefeller Plaza, then known as the RCA Building, the students’ focus was on stocking kitchen inventory and other back-of-the-house operations. But Baum, intent on seeing the elite supper club’s dining room, crept over to the service door and pressed his face against the window. Baum would spend the rest of his life exploring his vision of what New York was meant to be, along the way becoming, in the words of food writer Mimi Sheraton, “the Cecil B. DeMille of restaurateurs,” a man of lavish spectacle and over-the-top productions who transformed the restaurant industry into what it is today. Close to 45 years after that first glimpse of the Rainbow Room, Baum, by then the city’s earl of eateries, was called upon to oversee its $25 million overhaul; the shimmering Art Moderne palace that resulted became the masterwork of Baum’s storied career. In between these symbolic bookends, Baum created a string of the most stylish, original and influential restaurants of his day, a total of 167 between 1953 and his death in 1998. For a time, a handful of his creations—Windows on the World, the Rainbow Room, the Four Seasons and Tavern on the Green—were the four highest-grossing restaurants in Manhattan. “Clearly Joe’s history is the history of restaurants in New York in the second half of the 20th century,” says Tim Zagat. Much of what diners now take for granted was born of Joe Baum’s fertile imagination. Although the term “theme restaurant” cheapens Baum’s visionary conceptions and deeply researched menus—variously devoted to exotic cultures (the Hawaiian Room, La Fonda Del Sol), humble foods (the wurst house chain Zum Zum), or historic recreations (Forum of the Twelve Caesars)—he will forever be credited, or perhaps blamed, as the originator of this trend. In the late ’70s and early ’80s, long before “locavore” entered the lexicon, Baum’s Market Bar and Dining Rooms in the concourse of the World Trade Center listed local meat, seafood and produce purveyors, and brunch could begin with a bag of freshly picked peas in the pod. At Baum’s Kansas City establishment, the American Restaurant, chef Bradley Ogden was cooking with local produce and serving up Missouri ham. Baum exorcised the tired conventions of the fancy continental restaurant by throwing away menus in French and, along with them, the snooty term “sommelier.” He slipped lowbrow puns and winking allusions into his graphically innovative menus (the Mushrooms of the Sincere Claudius—An Emperor’s Delight at the Forum of the Twelve Caesars was one example), but also introduced Americans to quality domestic wines and exotic foreign ingredients. At his French restaurant, Aurora, Baum suggested that the young bartender Dale DeGroff study America’s earliest cocktails. DeGroff took the idea and ran with it, updating the old classics and eventually playing midwife to the modern mixology boom. Baum also pushed small plates at the bar to help boost drink tabs, presaging our love for tapas-style grazing. For better or worse, he brought informality to the fine-dining experience, even urging wait staff to introduce themselves to diners by their first names. No purse was too big or too small for Baum to court, and no palate too refined or rustic, either; he served roast loin of veal with anchovy hollandaise to the titans of Wall Street, media and advertising at the Four Seasons, and home-style canned tuna with cannellini beans and iceberg lettuce at the raucous Mama Leone’s in the theater district. Today many of Baum’s most famous creations are gone, including the recently deceased Tavern on the Green, yet his legacy lives on. In April, the Manuscript and Archives Division of the New York Public Library opened to the public the Joe Baum Papers: 1934–1988, an extensive trove of 158 boxes of material including sample menus, correspondence, articles and ephemera donated by Baum’s children. In March, a panel discussion on Baum’s impact in the restaurant world convened at the New School, featuring Michael Whiteman, Baum’s business partner from 1970 to his death; Milton Glaser, Baum’s favorite graphic designer and longtime collaborator; and architect Hugh Hardy, who worked on the redesigns of the Rainbow Room and Windows on the World. The man who so recreated America’s restaurant landscape in his own image, and whose paper trail now lies preserved alongside those of H. L. Mencken and Herman Melville, was born into the business in 1920 in Saratoga Springs, where he spent the summer months at his parents’ Gross and Baum Family Hotel. Back then, Saratoga Springs was the freewheeling watering hole of the rich, where mineral baths, gambling, horse racing and the workaday life of kosher innkeepers provided a mix of high and low that Baum relished. At age 10, in addition to working in his parents’ hotel pantry, he sold racing track scratch sheets, worked as a betting ring messenger and played nickel roulette. In a 1978 interview, the veteran restaurateur recalled his hormonally charged teen years: “I was 14 and my voice was changing. My parents put me to work in a big kitchen with wooden floors and windows. I was hooked. In love with the smells and the tastes, with the waitresses and the pantry girls.” Baum’s visceral, consuming love for restaurants was always rooted in the sensual: “I lust after their drama, their ambience, their professionalism, and their foodgloriousfood. I hunger, not for the thematic recreations…but for new pulses of pleasure that restaurants alone can bestow,” he said. At Cornell’s hotel school, his gambling skills kept him flush with cash his freshman year, but eventually put him in debt to “some guys with broken noses from Syracuse.” In the summer of 1941, he found a convenient escape at the Fort Benning Officers’ Club in Georgia, where he and a hotel school pal improved service by introducing a grill and replacing the former field hands who served as waiters. “We had a variety of beautiful women who provided a variety of services,” Baum said. The full-service concept was a hit with officers but not with the club administrator and Baum was fired. He joined the navy in 1943 and served as a supply officer aboard a destroyer in the Pacific during the war. Soon, stints at Harris, Kerr and Forster, an accounting and consulting company for hotels and restaurants; with the theatrical and industrial designer Norman Bel Geddes; and as manager of the Monte Carlo restaurant for real estate mogul William Zeckendorf gave Baum the ability to absorb restaurant financial sheets at lightning speed, a lifelong love of good design, and an obsessive attention to detail. At the Schine Hotel chain in Florida, Baum became director of restaurant operations. Miami, says Tony Zazulo, who headed catering and sales at the Rainbow Room and became a trusted advisor to Baum, “had a huge influence on Joe’s ideas about theatricality, entertainment and social interaction, how to make restaurants exciting.” It was while he was at Schine that Baum was hired by Restaurant Association and lured back to New York. Pulling out all the stops to lure both air and highway travelers to the Newarker, Baum added large portions to the pyrotechnics, such as the catchy “three-claw lobster” (a lobster-and-a-half), the too-bigto-slurp “knife-and-fork” oyster and the baker’s dozen of oysters, where the 13th oyster arrived on a separate plate to make the house’s generosity perfectly clear. When Restaurant Associates lost $25,000 its first year, Baum and his Swiss-born chef Albert Stockli didn’t cut spending, but continued to add value to their offerings. By the mid-1950s, the restaurant was grossing over $2 million a year. To research the Forum of the Twelve Caesars, Baum and his inner circle embarked for Rome, Pompeii, Herculaneum and Milan to soak up history, food and culture, as well as visit china factories, silversmiths and glass blowers. It was in Italy that Baum developed his love for black bespoke Brioni suits, “his armor,” according to David Risk, a former junior ad man for Baum who is now writing a biography on the restaurateur. Baum was the poetic wellspring, the general and conductor of his ambitious undertakings, operating with equal skill in both the front and back of the house. He conceived of himself as being not in the restaurant business, but in the business of pleasure. People stepped into the fantasies he created not because they were hungry, he insisted, but for the spectacle. Therefore every detail—from the menu’s paper stock and shape of the flatware to the buttons on the made-to-measure waiter’s costumes—had to be exquisite, one-of-a-kind. 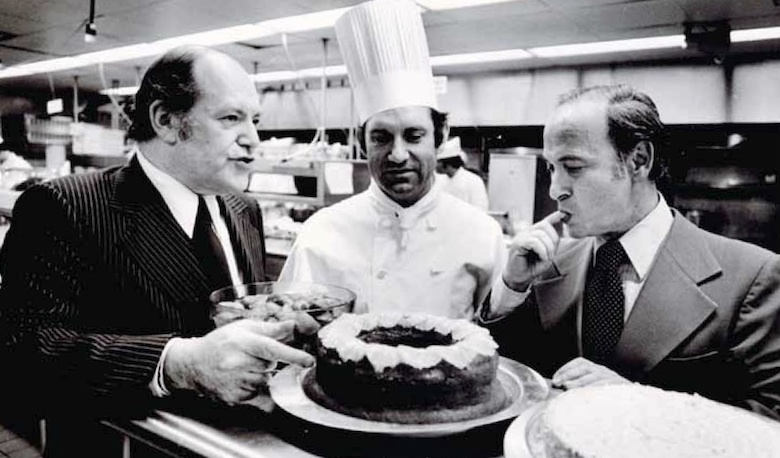 The menu consultants on Baum’s team became, if they were not already, leading names in the food world: James Beard, Jacques Pépin, Barbara Kafka and Rozanne Gold among them. In comparison to the saturnalian excesses of the Forum of the Twelve Caesars, the decor of the Four Seasons, which took two and a half years to plan and cost $4.5 million, was a model of restrained elegance, in keeping with the character of Mies van der Rohe’s Seagram Building. Baum’s good friend, House Beautiful editor Elizabeth Gordon, had introduced him to the Japanese concept of shibui, and Baum was taken with this idea of understated elegance, of quality that does not call attention to itself. He adopted the name of the restaurant from a book of haiku, and suggested changing the entire decor of the restaurant—from plants, menus, waiters’ uniforms and ashtrays, down to the color of the typewriter ribbons—with the advent of each new season. Decor included a Picasso curtain depicting a bullfight, tapestries by Miró, ceiling sculptures by Richard Lippold and chairs designed by Philip Johnson (also the restaurant’s designer) and Eero Saarinen. The food was to be equally refined, predominantly American and seasonal: a beefsteak tomato, carved tableside; dandelion and egg, or simply prepared main courses such as “brochette of young pork with spiced crab, apple and onions” or “tournedos of beef with woodland mushrooms.” Menu consultant James Beard, who was already considered the dean of American cooking, fantasized about blueberry slump and luscious crab cakes and reported to Baum on a lamb ragout he had tasted ‘so wonderful you just wanted to cuddle it in your arms.’” In her book Eating My Words, food writer Mimi Sheraton, who also served as a consultant for the Four Seasons, recalled researching obscure ethnic food lore and searching for such produce as radicchio, mâche, fiddlehead ferns and ramps when even gourmet food markets of the day carried little beyond iceberg, endive and bibb lettuce. The oversized menus (which introduced the now-iconic tree logo designed by Emil Antonucci) were printed on vellum and covered with silk-threaded Japanese rice paper; very shibui. They were also very expensive to produce. “He could really see things in an entirely different way,” says Irena Chalmers who spent 15 years as Baum’s scribe and speechwriter. “He could visualize a new place, he could hear the people speaking, see the traffic pattern, smell the food.” Many of Baum’s associates have commented on his unique way of communicating, which they describe using adjectives ranging from “incomprehensible” to “abstract.” Baum’s poetic, stream-of-consciousness musings and non-sequitur demands drove some employees crazy, especially after being trapped with their chain-smoking boss in endless meetings and left holding little but hazy, nicotine-infused impressions. Because Baum’s genius was of an emotional, aesthetic and primarily visual nature, he found kindred spirits in his most accomplished designers and visual artists, most notably Glaser. Baum worked seven days a week and never went anywhere without his bulging briefcase, yet his wife, Ruth, was always by his side as he made the rounds of his restaurants in the evenings. Weekends were spent at the family country home in northern Westchester, where the food was simple, seasonal and primal. Charles recalls, “There was a lot of bare-knuckled eating. Our hands might be wrapped around some thickly sliced tomato on whatever the bread of the moment was, laden with watercress from the stream, some sliced onion. There was always a ‘gracious amount’ of beverage, a lot of champagne, wine, it didn’t matter what time of day.” Ruth and Joe were known for throwing “huge, crazy family parties,” that corresponded to the lavish bashes Baum was famous for staging at his restaurants, says daughter Hilary. Sometimes Baum house parties ended with wild food fights, which, according to Charles, were usually instigated by his father. Despite the good times, having a dad who was described as a tyrant even by employees who gladly swore lifelong fealty to him could not have been easy. Both Hilary and Charles describe their father as “very challenging” as a parent, an intensity diluted only by the fact that he was always at work. On those occasions he was at home, he often summoned the family to the dining room table to show them architectural plans and concept papers for his latest project. The irony was that despite his fluency with numbers (he devoured financial sheets “like a novel,” says Baum’s son Charles), Baum had no interest in sticking to a budget. “He felt that money wasn’t very interesting,” says Chalmers. “It was the idea that was the challenge, and it didn’t really matter to him what it cost.” Tim Zagat adds, “Joe never did anything under budget.” It was a trait that liberated Baum creatively but would play a part in the abrupt end of his career at Restaurant Associates. Cut loose from Baum’s obsessive oversight, his creations floundered. La Fonda del Sol—the super-nova of a restaurant designed by Alexander Girard, featuring smart waiters’ uniforms by Rudi Gernreich and stuffed with folk art and pottery—was sold. The restaurant that had introduced New York to authentic pan-Latin cuisine (baby turkey in spicy mole sauce, in the early ’60s) was reduced to a pedestrian Tex-Mex joint. The Four Seasons, Greene noticed, began to show signs of fraying due to budget reductions. But within a matter of weeks, Baum would come roaring back, landing the Port Authority contract to develop all 22 restaurants in the new World Trade Center. The massive job included devising a complex of restaurants called Market Square down below and the 107th floor showpiece, Windows on the World. Combined, they served over 25,000 covers each day. 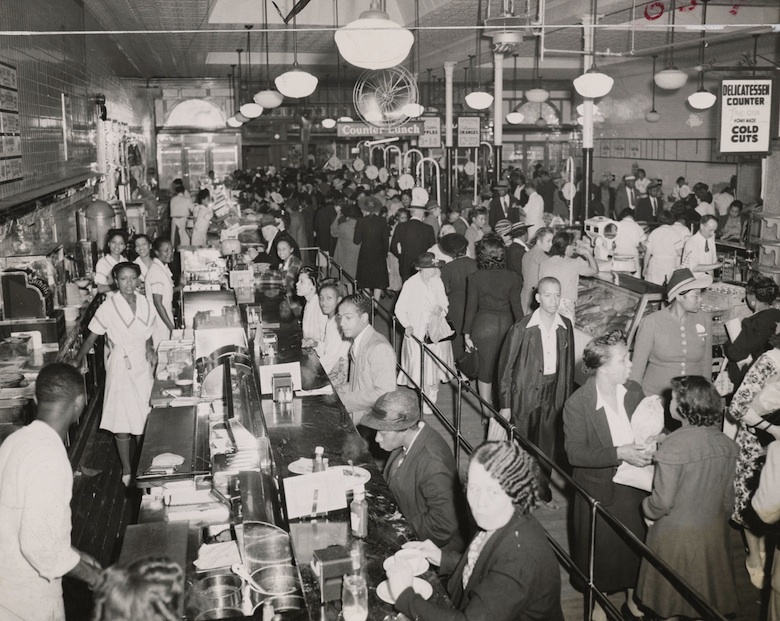 In one Market Square restaurant, the Big Kitchen, Baum paid homage to the old Washington Market—which had been razed to make way for the Trade Center—by creating market-style food stalls. Windows on the World opened in 1976 and was an instant hit. A New York Magazine cover headline swooned, “The Most Spectacular Restaurant in the World,” called Baum “brilliant” and his aerie overlooking a crumbling lower Manhattan a “masterpiece.” Windows became one of the highest grossing restaurants in the world. The Rainbow Room was Baum’s crowning achievement. “It was such a gift to the city, and I think it gave him particular joy,” recalls Hilary Baum. Baum also hired his son Charles to serve as general manager of the Rainbow Room. It’s no surprise that in addition to Charles, many Baum offspring went into food-related businesses. Hilary became a leader in the farmers market movement; her seminar series called the Baum Forum focuses on preserving a healthy, diversified food system. Hilary’s daughter Annie runs Milk and Honey, a locavore café and store in West Philadelphia, and her son Alex is project manager for the BLT restaurant group. Although Charles retired from the restaurant industry to resume his career as a photographer, he participates in it vicariously through the work of his wife, prominent restaurant publicist Jennifer Baum. Baum’s last major restaurant job was to oversee the $25 million 1996 reopening of Windows on the World after the first terrorist bombing. He was suffering from the prostate cancer that would eventually kill him, yet still managed to oversee every last detail of the project, from the crystal balustrades to the Milton Glaser screen behind the front desk. Finger in many pies: Baum in a kitchen at the World Trade Center, where he developed all twenty-two original restaurants including the 107ty floor showpiece, Windows on the World. Photo from the Joe Baum papers.